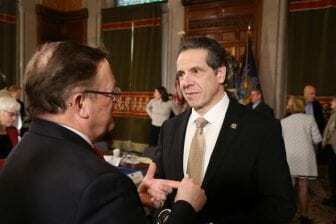 VESTAL, NY (WSKG) – This week, survivors of child sexual abuse had a big day in Albany. The Child Victims Act passed the legislature, ensuring people who had been previously barred by New York’s statute of limitations can now have their day in court. The law does a lot. It raises the statute of limitations for both civil and criminal cases and it opens up a one-year look-back period so old cases that could not got to trial could be resurrected. There’s fear that such a “look-back” could result in huge financial penalties against churches, schools, towns and villages implicated in sexual abuse cases. Just before the Child Victims Act was approved, the Catholic Church in New York dropped its objections against it. The one-year look-back was a sticking point. Danielle Cummings speaks for the Syracuse Diocese. Last spring, Cummings was quick to say the Church isn’t only group impacted by the one-year look back. “Let’s keep in mind that the governor has included public entities, has included churches, has included all of those. So it’s not a one-year window that’s opposed by the church,” said Cummings. Just before the Child Victims Act was approved, the Catholic Church in New York dropped its objections against it. Under the act’s final version, the Catholic Church could still suffer tougher penalties than schools and villages. “One of the reasons why I think the Catholic Church has been sort of in the bullseye of child sexual abuse litigation is because of its internal structure, the hierarchy of the church.” said Marie Reilly, who’s Catholic and a Penn State Law Professor. She’s written on bankruptcy in the Catholic Church across the country. “The bishop is able to move priests around in the diocese,” Reilly continued. It can be hard to know what a Catholic diocese is worth. What are the churches assets? Even if it finds the money, how does it then keep the lights on after paying these claims? “A diocese isn’t a business and, yet, it has to think about where the money is going to come from tomorrow in order to continue its mission,” Reilly said. That’s why dioceses around the country have turned to bankruptcy. Like in Minnesota, when its state legislature passed a law like New York’s Child Victims Act. The Dioceses of St. Paul and Minneapolis declared bankruptcy and settled for $210 million. That’s not a direct comparison; different dioceses have different assets. Plus, the number of people who will come forward in New York is hard to predict. Still, attorney Ron Benjamin is confident the payout will be big. “In any of these cases that are brought before a jury, if a jury hears not only that the victims were sexually abused, but that the church had a policy and practice of sending those same priests that abused altar boys in one parish to a new parish where they then continued the same activity,” Benjamin said. “I think a jury hears they’re going to be very angry and come back with some pretty huge numbers,” he added. Now that the Child Victims Act is law, Benjamin is reviving a suit he originally filed in 2002 against the Vatican, the Diocese of Rochester, then Bishop Matthew Clark and St. Patrick’s Church in Owego. It’s just one of what is likely to be several such cases which will be resurrected in the coming year.